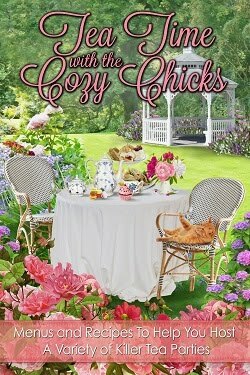 Cozy Chicks: Too Soon for Christmas? Okay, it's a *little* early for Christmas talk, but it seems as though I'm already getting Christmas catalogs in the mail. And I'm making my Christmas list. 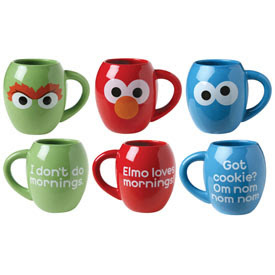 I want the Cookie Monster and Oscar mugs (not so fond of the Elmo--sorry, Elmo!). Usually, I only drink out of mugs that have lips around the rim (or I dribble), but in this case I may make some exceptions. How can I not? It's Cookie and Oscar! They're worth a little dribble. Do you have anything on your wishlist yet? Gorgeous cover! Sounds like the perfect way to spend the snowy January days! Thanks, Sarita! I'm so excited to share the story with everyone. I'm still wishing for an iPad and I know they only way I'm getting it is to buy it myself. Never too early to start thinking about Christmas. Pulled out the Christmas music just this week. Time to add a few to the cycle of music. The cover is fantastic! Did you do a happy dance when you saw it? I need one of those Oscar mugs and yes, I have some pages in catalogs turned down already. Stuff for the kids, but they are getting harder to buy for as they get more interested in costly gadgets! Love, love the cover. Can't wait to read it. Lovely cover, congrats on that. No, I just had my birthday, so not really thinking about Christmas yet. And mostly, if I want something, I just buy it and don't wait for Christmas or something. Anon, I don't know about Christmas music yet... Oh, all right, I wouldn't mind. LOL. Ellery, I did! I love it! I understand completely about how hard it is to shop for older kids. Teens are the worst to buy for. I stress about it every year and miss the days when a couple of Batman or Pokemon toys made them so happy. Hi Aurian, thanks! And happy late b-day! I have yet to think of anything I could want or need for myself, but I am DEF already thinking of the kid's gifts! I feel like I do this earlier and earlier every year now, too, which cannot be good :) I mean it's bad enough that you can't escape Christmas in the stores from November 1st on, and here I inflict it upon myself even sooner. LOL! I have thought of Christmas but not too deeply yet. More of the snow falling in big fat fluffy flakes, hot chai vanilla latte, curled up and cozy inside with a book. My sons are grown now, but I am very grateful that I never really went over board with them; I didnt really have a choice. But it has made them very thankful for what they do get. Even now. 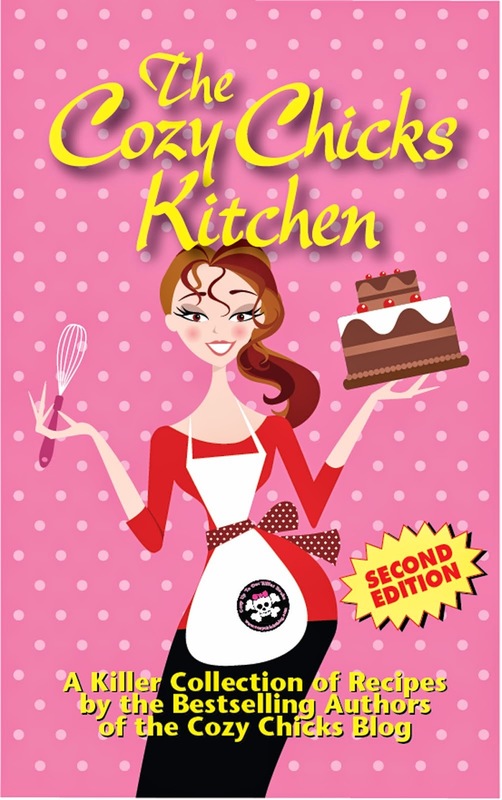 And yeah, that is a smokin book cover! cant wait to read it. OK...what catalog did those mugs come from??? One item on the Christmas list is a Nook. That cover is just perfection! I can see why you're so excited. 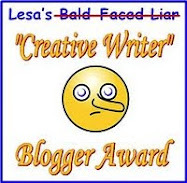 Love the Oscar mug...I may have to add that to my own wishlist, LOL. Ah, Lori, you paint a cozy picture! Esp. during these hot, hot days. I only have one thing on my Wish List, but I have got to go through my mags and find some ornaments to do for Christmas, some friends and family expect them every year. Their Cross-Stitch but I'm very picky about the ones I do. They have to be perfect and something each person would love. I've already started my shopping. Big family-it's easier and less stressful. Until I forget where I hid stuff. Sometimes they get it for their next birthday. Or the following Xmas. I saw those mugs earlier today and about died, but I have so many of them now! Added you book to my calendar..LOVE the cover! First, I LOVE the cover and can't wait for the book. Second, I love the Signals catalog. Well, actually...I'm a catalog addict. If I won the lottery (which could be tough, since I don't play), I would just sit home and order from catalogs. I go through them constantly and turn down the pages with things I like. Would probably be easier to turn down the pages that DON'T have something I like. I only order things a couple times a year tho, and usually for someone else. As far as Christmas, I buy all year round. I have a closet where I put the things (so I don't lose them) and when I see something that would be good for someone or is a great deal, I get it. That way it's not such a strain at the holidays (and I don't have to go out when it's so crazy). I've done that the last few years and it's worked out very well for me. I probably have at least 1/2 my shopping done right now. Ev, losing gifts happens to me, too! LOL. I have too many mugs as well, but I figure a few more won't hurt. Lace-making, Book Dragon? Sounds amazing! Hope you get everything you need. And thanks for adding ITaW to your calendar! Hi Lynda! Isn't the Signals catalog great? There's always something in there I have my eye on. And you're right--buying a couple of presents all year long really takes the financial pressure off at Christmastime.